Khorixas Lodge Khorixas accommodation guide everything you need to know before visiting Khorixas Lodge Khorixas Namibia. 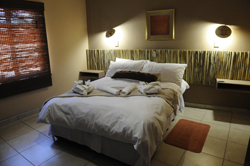 Photographs, room types, activities, facilities, location booking information costs rates and prices for your stay at Khorixas Lodge Khorixas, read all the accommodation information about Khorixas Lodge. 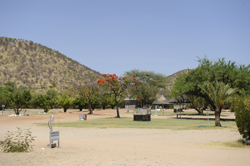 Khorixas Lodge is the ideal stopover between Etosha and the Kunene region and Skeleton Coast Park. 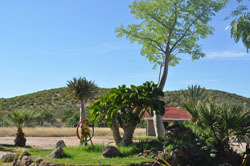 Nestled in the hills of Damaraland, it provides a relaxing environment for travelers, weary after a day's exploration. The area is an explorer's paradise where guests can visit the land of the Welwitschia mirabilis at Burnt Mountain, curious stone formations, the petrified forest, ancient rock engravings and experience other unusual geological phenomena. 10 Single Rooms: Bathroom with shower. One single bed and mirror with a table, built in cupboards, a tea station and no fridge air Conditioning. 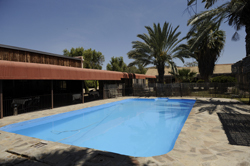 26 Bush Chalets, 2 Bed: Two types available. 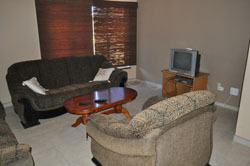 Chalet numbers 1 to 19 are large and more spacious. Of these chalets, numbers 11, 13, 15, 17 & 19 have no braai facilities. 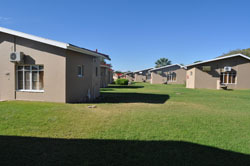 Numbers 20 to 26 are smaller and each have a shared braai area for every 2 rooms. Not all rooms have fridges in them. 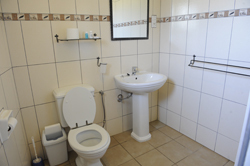 2 family Chalet (VIP Chalet)Two family units each with two bedrooms and a self-catering kitchen, also equipped with TVs and DStv. Bedrooms have built in cupboards and air conditioned. NB of these only 9 are on a lawn and have braai facilities.